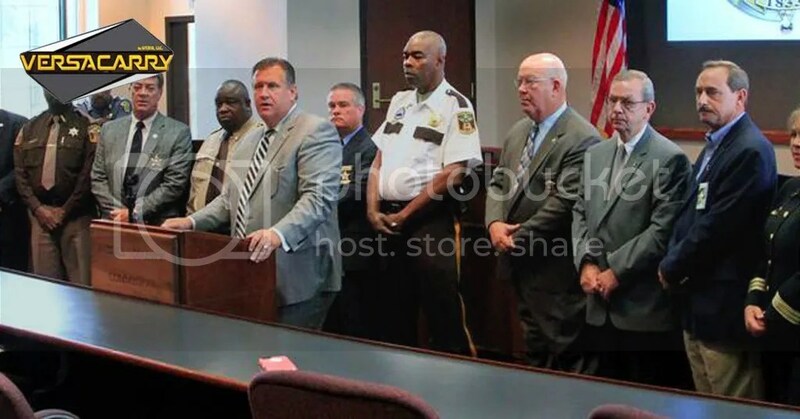 Alabama’s sheriffs are speaking out about what they call serious concerns with the state’s gun laws, according to Russell County Sheriff Heath Taylor. Flanked at the Russell County Courthouse Tuesday morning by a dozen sheriffs from Morgan County in the north to Marengo County in the south, Taylor used recent Louisiana theater shooter Rusty Houser, a former Phenix City resident, as an example of how legislative changes to Alabama’s gun laws have handcuffed law enforcement’s ability to protect the public. Houser, who killed two people then himself on July 23 in a Lafayette, La., movie theater, was denied a concealed carry permit by the Russell County Sheriff’s Office in 2006. The Alabama legislature changed the law in 2013 to make it easier to get a concealed carry permit. Before 2013, the law said the sheriff “may” issue the permit, but the new law changed the word to “shall” issue a permit. Houser was denied his concealed carry permit by Taylor and then-Sheriff Tommy Boswell based on previous arrests for domestic violence and arson. Houser was not convicted of either charge, but in 2006 the sheriff’s office was able to use those legal issues to deny the permit. Morgan County Sheriff Ana Franklin asked the toughest question of the day about the Houser comparison. Under the current Alabama law, a sheriff can deny a permit, but it comes with too many strings and is likely to be overturned in District Court. Houser legally purchased the gun he used in the Louisiana theater shooting from a Phenix City pawn shop. The federal background check on Houser did not reveal a history of mental illness. Georgia law allows gun owners to carry a weapon in their vehicles without a permit. At times that difference in the law presents an issue for gun owners going back and forth between Georgia and Alabama, Taylor said. Alabama sheriffs, including Taylor, insist this is not gun-owner rights issue, but, rather, a public safety issue. And the most important tool is giving sheriffs the ability to use common sense and judgment, Franklin said.